In South Asian cuisine, split lentils (often with their hulls removed) are known as dal. Dal, usually eaten with rice or roti, is a dietary staple throughout regions of India, Pakistan, Bangladesh and Nepal. As a food crop, the majority of world production comes from Canada, India and Australia. According to the USDA National Nutrient Database, 100 g of raw lentils (variety unspecified) provide 353 calories; the same weight of cooked lentils provides 116 kcal. Raw lentils are 8% water, 63% carbohydrates including 11% dietary fiber, 25% protein and 1% fat (table). Lentils are a rich source (20% or more of the Daily Value, DV) of numerous essential nutrients, including folate (120% DV), thiamin (76% DV), pantothenic acid (43% DV), vitamin B6 (42% DV), phosphorus (40% DV), iron (50% DV) and zinc (35%), among others (table). When lentils are cooked by boiling, protein content declines to 9% of total composition, and B vitamins and minerals decrease due to the overall water content increasing (protein itself isn't lost). The low levels of readily digestible starch (5%), and high levels of slowly digested starch, make lentils of potential value to people with diabetes. The remaining 65% of the starch is a resistant starch classified as RS1. A minimum of 10% in starch from lentils escapes digestion and absorption in the small intestine (therefore called "resistant starch"). Lentils also have anti-nutrient factors, such as trypsin inhibitors and a relatively high phytate content. Trypsin is an enzyme involved in digestion, and phytates reduce the bioavailability of dietary minerals. The phytates can be reduced by prolonged soaking and fermentation or sprouting. Lentils are relatively tolerant to drought, and are grown throughout the world. FAOSTAT reported that the world production of lentils for calendar year 2013 was 4,975,621 metric tons, primarily coming from Canada, India and Australia. 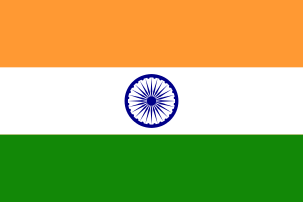 About a quarter of the worldwide production of lentils is from India, most of which is consumed in the domestic market. Canada is the largest export producer of lentils in the world, and Saskatchewan is the most important producing region in Canada (growing 99% of Canadian lentils). 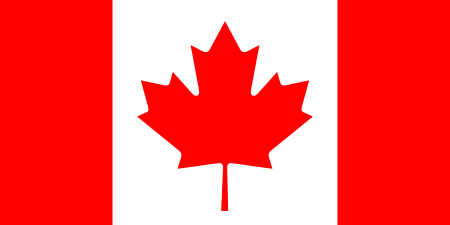 Statistics Canada estimates that Canadian lentil production for the 2009/10 year was a record 1.5 million metric tons. The most commonly grown type is the Laird lentil. The seeds require a cooking time of 10 to 40 minutes, depending on the variety—shorter for small varieties with the husk removed, such as the common red lentil—and have a distinctive, earthy flavor. Lentils with husk remain whole with moderate cooking; lentils without husk tend to disintegrate into a thick purée, which leads to quite different dishes. Lentil recipes are used throughout South Asia, the Mediterranean regions and West Asia. They are frequently combined with rice, which has a similar cooking time. A lentil and rice dish is referred to in Arab countries as mujaddara or mejadra. In Iran, rice and lentil is served with fried raisin; this dish is called Adas Polo, and usually comes with ground beef. Rice and lentils are also cooked together in khichdi, a popular dish in the Indian subcontinent (India and Pakistan); a similar dish, kushari, made in Egypt, is considered one of two national dishes. Lentils are used to prepare an inexpensive and nutritious soup all over Europe and North and South America, sometimes combined with some form of chicken or pork. Dried lentils can be sprouted by soaking in water for one day and keeping moist for several days, which changes their nutrition profile and reduces undesirable phytic acid. Lentils are commonly eaten in Ethiopia in a stew-like dish called kik, or kik wot, one of the dishes people eat with Ethiopia's national food, injera flat bread. Yellow lentils are used to make a non-spicy stew, which is one of the first solid foods Ethiopian women feed their babies. In the Indian Subcontinent lentil curry is part of the everyday diet, eaten with both rice and roti. Boiled lentils and lentil stock are used to thicken most vegetarian curries. They are also used as stuffing in dal parathas and Poori. Lentils are also used in many regional varieties of sweets. The word "lens" in optics comes from the lentil-like shape of early double-convex lenses; lentil is lens in Latin, and gives its name to the botanical genus Lens. In Jewish mourning tradition, lentils and boiled eggs are traditional as food for mourners, because their round shape symbolizes the life cycle from birth to death. 1 2 3 Leah A. Zeldes (16 February 2011). "Eat this! Lentils, a prehistoric foodstuff". Dining Chicago. Chicago's Restaurant & Entertainment Guide. Retrieved 4 August 2011. ↑ "Cook's Thesaurus: Lentils". Foodsubs.com. Retrieved 15 December 2015. ↑ "Nutrition Facts for Raw Lentils, 100 g". Conde Nast, USDA National Nutrient Database, version SR-21. 2014. Retrieved 24 March 2015. 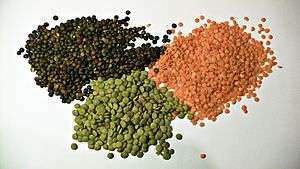 ↑ "Lentils, mature seeds, cooked, boiled, without salt per 100 g". Conde Nast, USDA National Nutrient Database Release SR-21. 2016. Retrieved 6 October 2016. ↑ Tovar J (1996). "Bioavailability of carbohydrates in legumes: digestible and indigestible fractions". Arch Latinoam Nutr. 44 (4 Suppl 1): 36S–40S. PMID 9137637. 1 2 "Lentil (Lens culinaris)". Pulse Canada. Retrieved 24 January 2015. ↑ "Crop Profile for Lentils in Idaho". Department of Plant, Soil and Entomological Science, University of Idaho (web site). 2000. ↑ "Red lentil recipes". BBC. 2011. Retrieved 4 August 2011. ↑ "Ajwaini Panch Dal". Retrieved 14 February 2014.